When you plan to work with mobility solutions, you have to be extra careful with who views the data and how it is viewed. Under no circumstance can you compromise on data security. It is for this reason that you need to create levels of data protection and allow certain kinds of employees to access a particular type of data. The most common data classification is – public data, confidential data, and restricted data. As the name suggests, public data is that category which is more or less open for all. You don’t need stringent security gateways and set restricted access. The data that you categorize as public can be viewed by all, on any device. Confidential data, on the other hand, is putting levels of security walls on some types of data. However, if such data is leaked, it doesn’t cause significant loss to the business. You can set control on confidential data by providing virtualized access on BYOD. However, the same level of encryption might not be necessary on enterprise-grade devices. Restricted data is the category where you must have stringent security controls. This type of data should not be breached under any circumstance as this can result in reputational and financial loss. Restricted data should only be accessed on enterprise-grade devices. Adhering to industry-standard compliances helps in overcoming security challenges to a large extent. Currently, there are more than 300 privacy and security-related standards which assist in making mobility solutions secured. 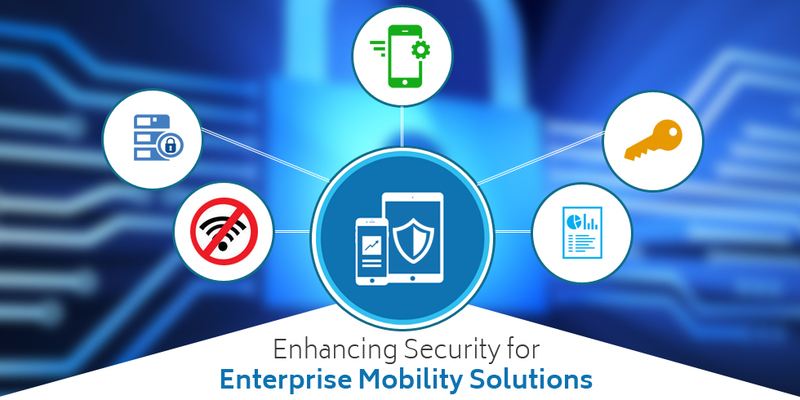 When you even think of enterprise mobility, you must keep these compliances in mind. During the development phase, you must also ensure that the mobility solution is compliant with your company policies. It is important that the solution you create seamlessly comply with government mandates adhere to corporate security policies and also have secured data storage options. One of the common problems that continue to arise again and again when we talk about security and mobility solutions in the same breath is the issue of ownership. The question is who owns the enterprise mobility? It is a tricky question actually because, on one hand, you are giving the employees the freedom to work on their choice of device, while on the other hand the enterprise solution is developed by you. It is a complex matrix – user and service provider – and which often can lead to security breaches. That’s the reason why you must address this issue at the earliest. It is important that the rules are clear when BYOD and mobility go hand-in-hand. How your enterprise solution is getting connected to the network is also an important consideration when dealing with security challenges. It is quite a challenge to enforce highest levels of security on the enterprise application and yet not compromise on usability. If these two things contradict, then you will end up having a fiercely secured application with no takers. But there’s a hack here. You can give your choice of security gateways in such a manner that the user doesn’t have to ‘enable’ them – they get to work in the background once the sign-in is made. Lastly, it is unrealistic if you attempt to control every aspect of a mobility environment. That’s where making optimum use of mobility management models comes to the picture. You must decide management models that can work best for you. This approach will let you verify if a device has been jail broken, will allow you to manage apps on a BYOD device and bring forward a centralized system for managing data. Read Also : How to Devise an Enterprise Mobile App Strategy Developing an enterprise mobile strategy is no longer a choice but the need of the hour. You simply cannot ignore its importance. If you are keen on developing such a solution for your business, get in touch with a mobile app development company which has the required expertise in the field. At Silver Touch Technologies, we have the necessary infrastructure and team for developing security enterprise solutions. Get in touch with us at info@semaphore-software.com.